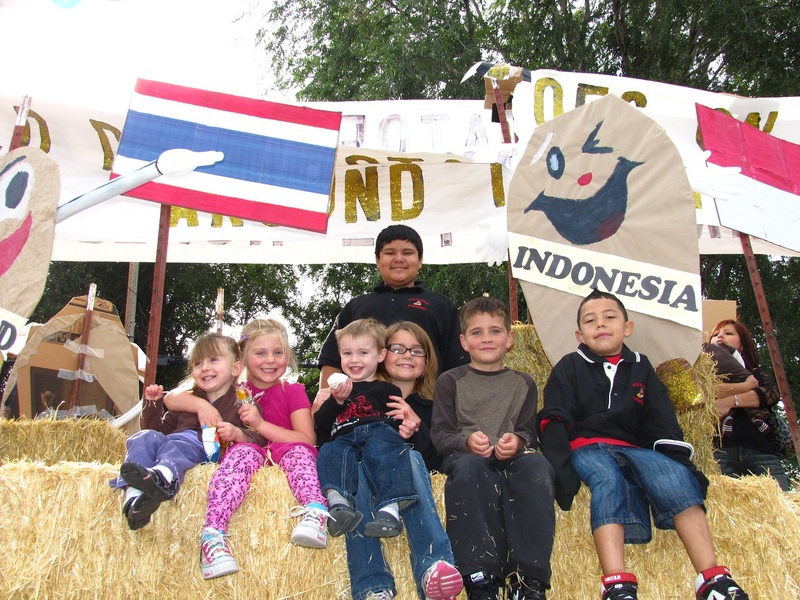 74th Annual Klamath Basin Potato Festival Time! 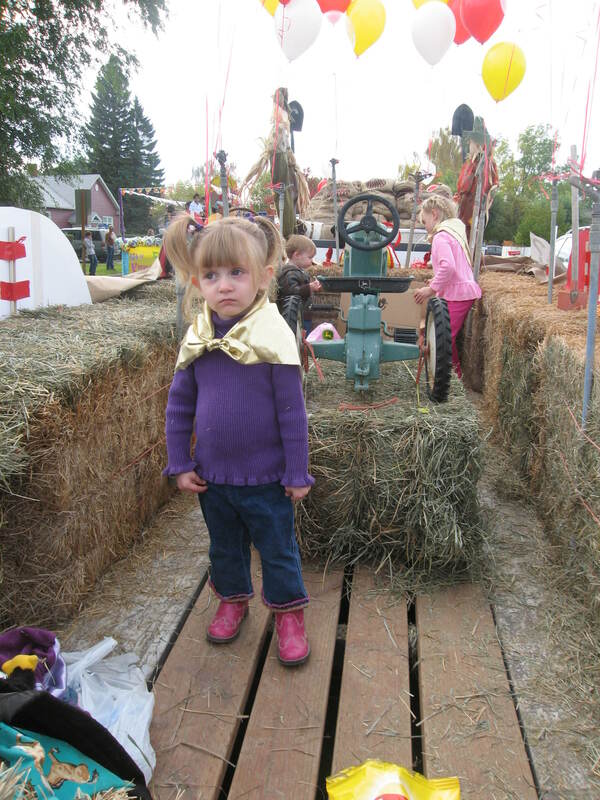 When mid-October rolls around, most spud farmers are still out in the fields harvesting their potato crops, but that doesn’t keep Merrill from getting flooded with folks coming to take in the Klamath Basin Potato Festival. With a nice, sunny Saturday morning, Highway 39 was lined with people from all around the Basin to take in the pageantry of the 74th Annual Potato Festival parade. This year, we vowed to not be beaten by the Merrill branch of Sterling Savings Bank. For the last few years, we thought we had one heckuva’ float only to be outdone by the bank crew. This time around, we decided to go big – big rig big. 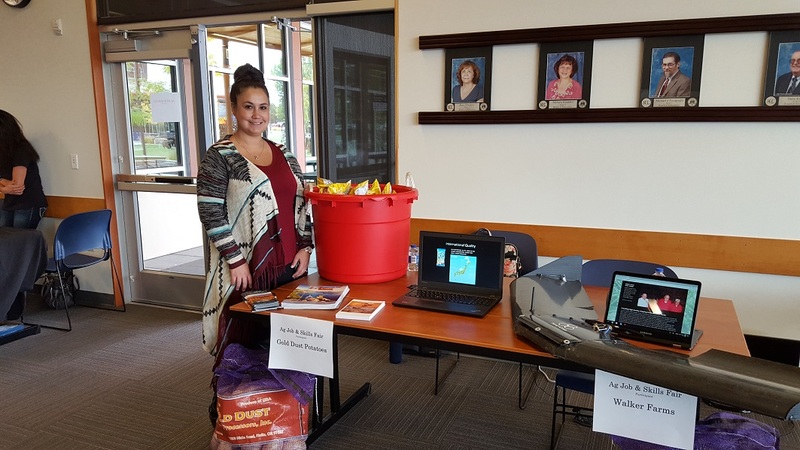 Office assistant Keely Oswald generaled the valiant Gold Dust office crew to put together a monster of a float to celebrate this year’s theme “Potatoes On Parade”. The Friday before the parade, flags and Mr. Potato Head-like characters were created wearing pageant banners advertising the various customers we had and countries we ship chipping potatoes to. 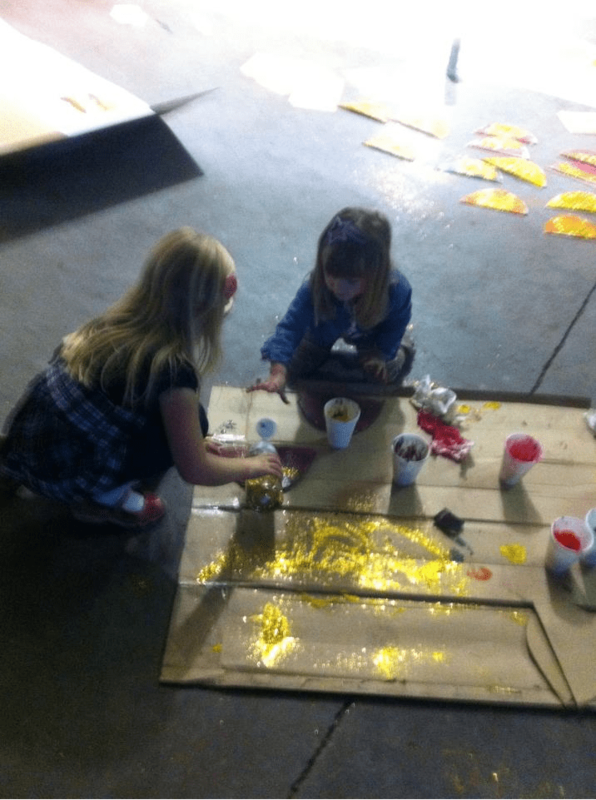 Even Tricia’s daughters, Rory and Mari, were put on the production line painting shoes for the potatoes to wear. It was definitely a team effort with all-hands on deck! 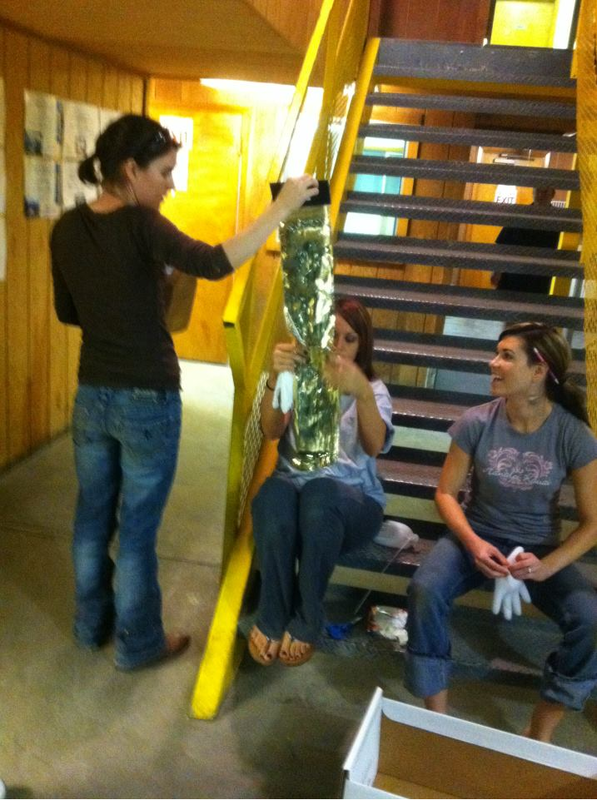 Saturday morning, the Gold Dust crew gathered in Merrill to race the clock to put the float together. 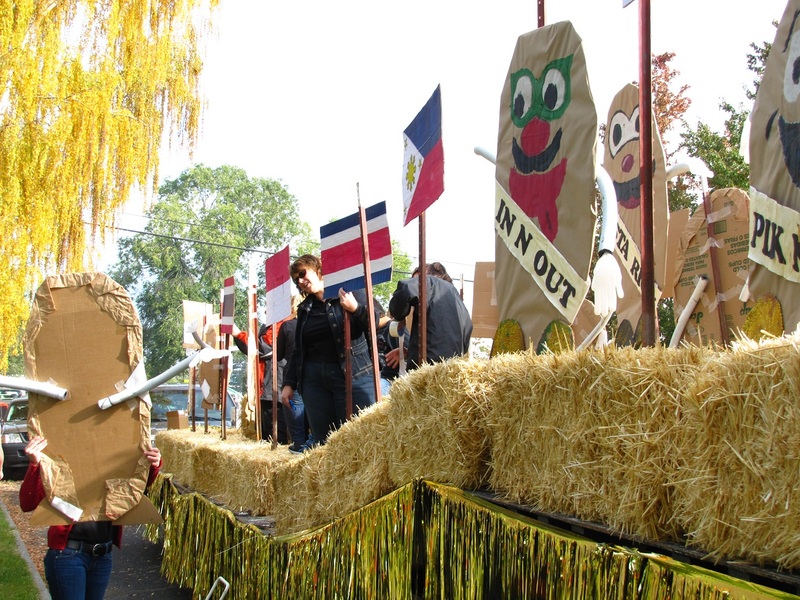 Straw bales were piled high and the potato characters placed for the ride down the parade route. Even Lexi’s friends from Portland, Scott and Haley Fish, pitched in to assemble the float. The icing on the cake was our special delivery of red, white and blue balloons delivered by Clee and Sheila Crawford of Blue Sky Hydroponics. Now THIS was a float! And a little after 11 a.m., we rolled out, fifth in line, to toss candy and hand out bags of Lay’s chips to people lining the street. While we hope to have finally taken first place away from Sterling, even if we didn’t, watching the kids scramble for candy and sharing the product of one of our customers was a lot of fun. 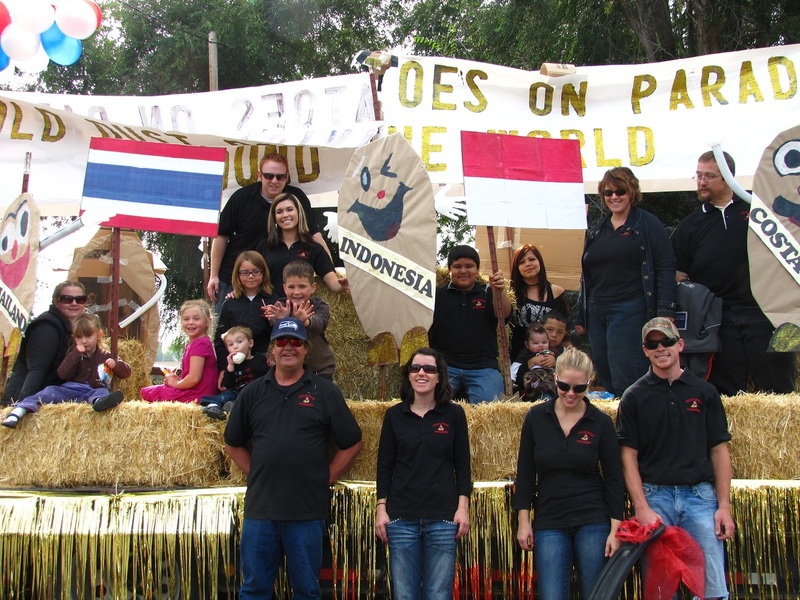 While every year we spend time on the blog talking about the parade and our float, let’s not forget that this is a potato festival – with potato judging! 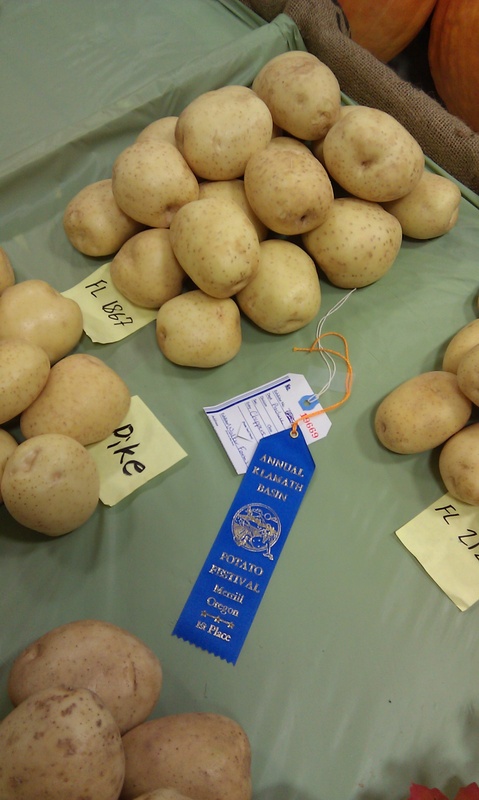 This year with the help our agronomist Dan Jepsen and intern Tatsuma Inui, we entered a collection of chipping potatoes to be judged, which took home the blue ribbon! 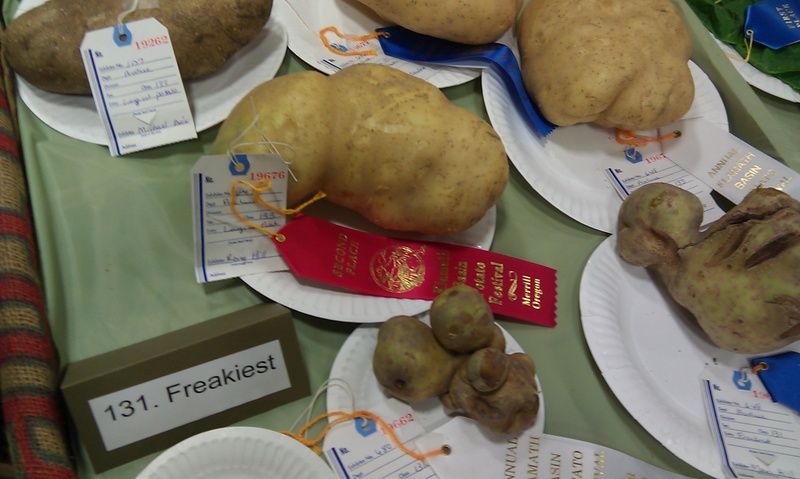 Dan and Tatsuma were also instrumental in providing potatoes for our kids Rory and Mari Hill, Walker Crawford and Hector Briseno to pick and enter in the Freakiest Potato competition (and yes, they won ribbons too!). 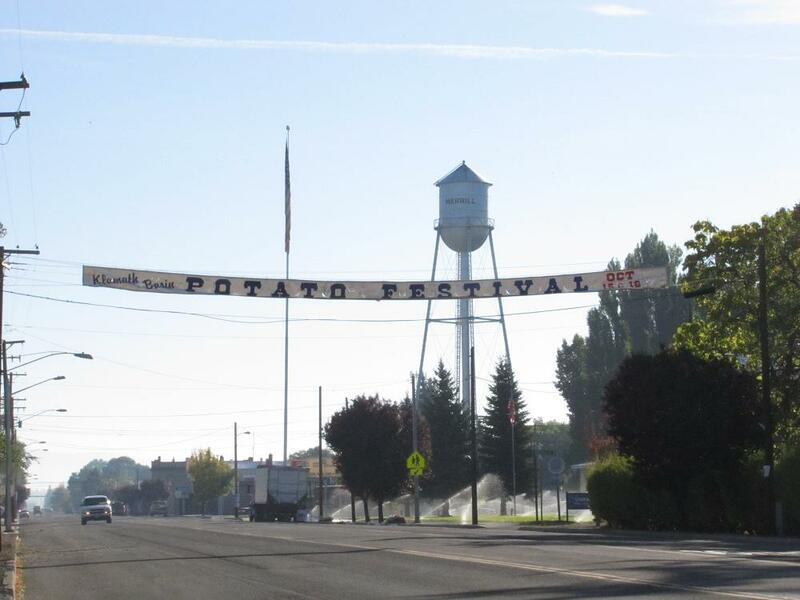 If you’ve never been to the Klamath Basin Potato Festival, make sure you leave mid-October open next year for the 75th anniversary. Merrill has a great small-town feel, and with high-school football games, vendors selling everything from potato chip cookies to Irish sundaes to quilts, and Old Time Fiddlers providing nice background music, there’s something for everyone to enjoy. We hope to see you next year! 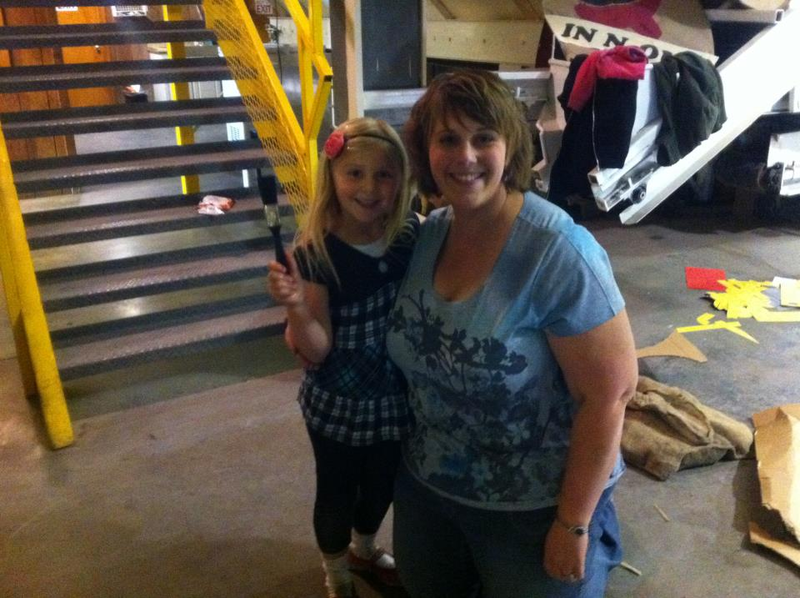 Tricia and her daughter, Rory, are ready to get messy! Alright, Rory and Mari, you need to make sure those shoes are extra sparkly for the parade! Nayeli, are you able to find a phone in there? 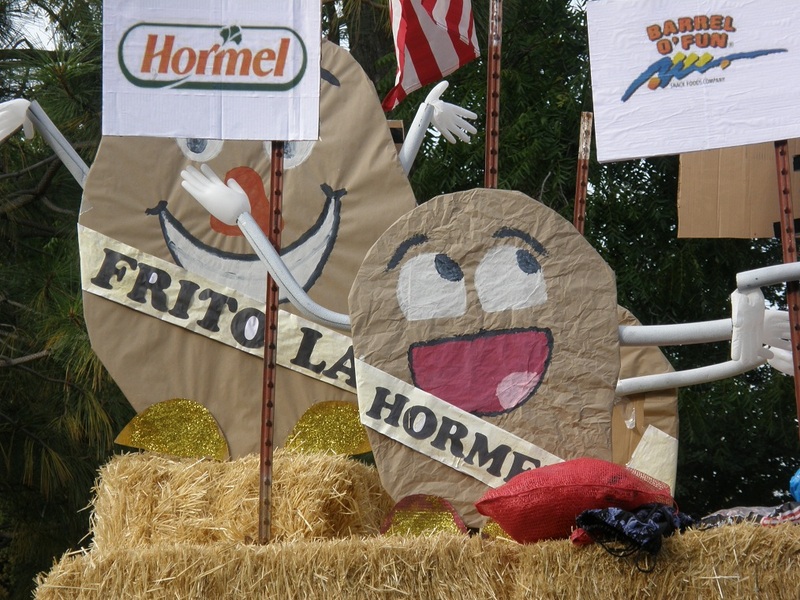 Frito Lay and Hormel are ready to go! TJ, are you excited or what?!?!?! Well done, folks! Thank you all for your help! 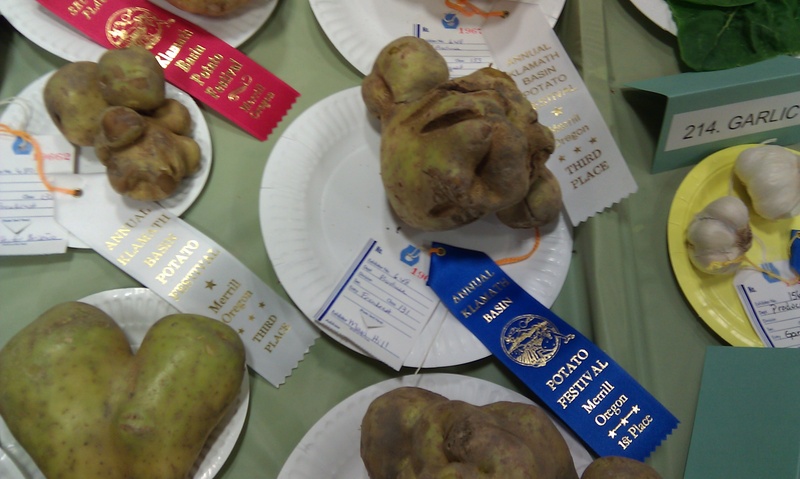 Here’s our blue ribbon “Freakiest Potato”. Look at all those other ribbons too! That float looks pretty awesome, huh? Want to see it in action rolling through Merrill? Before we wrap up this post, we have a lot of thank you’s to give out. 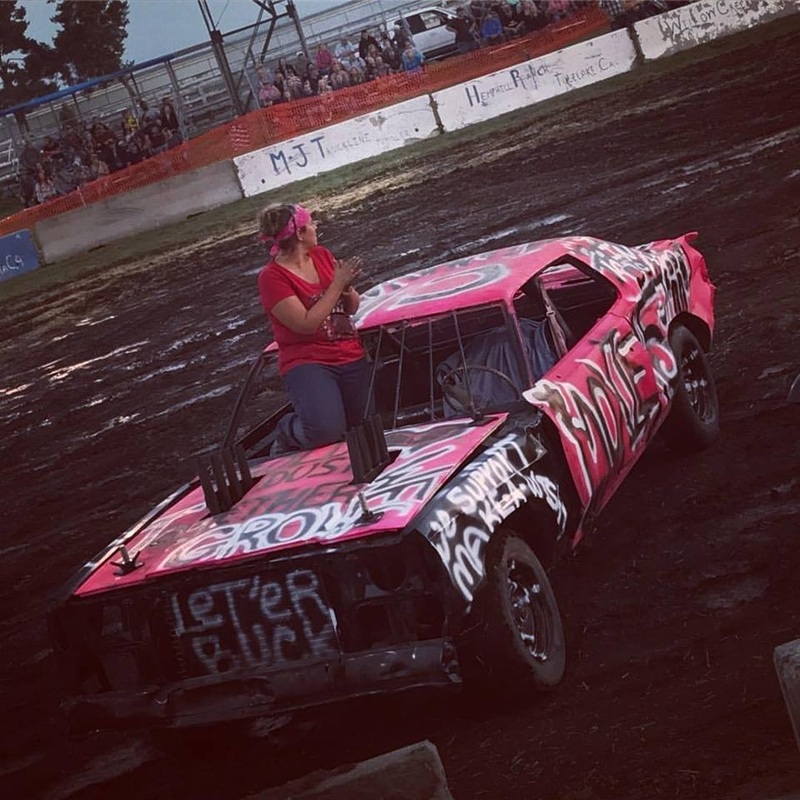 First off, we’d like to thank Keely Oswald for taking on the float and putting in the leg-work to make it awesome. 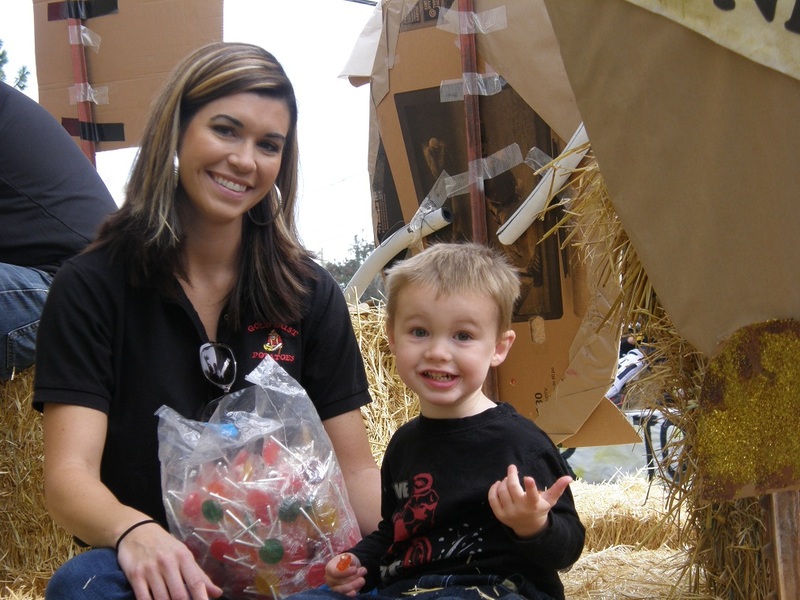 And thanks again for getting your husband, Nick, to donate the straw for the float! 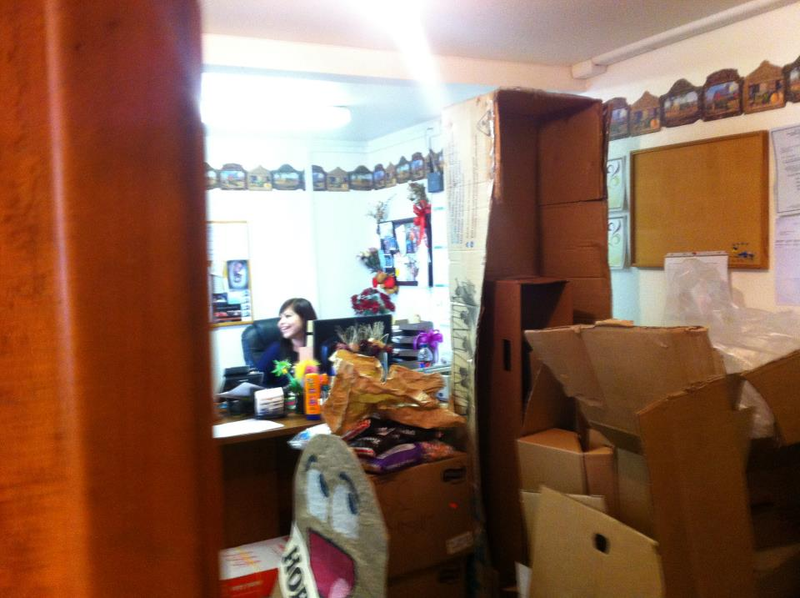 We’d also like to thank the Gold Dust office crew – Lexi, Sarah, Nayeli, Mayra, Necia and Tricia for putting in the extra work to help make Keely’s vision a reality. We’d also like to thank Rich Wright and his family, Brock Phillips, Scott and Haley Fish and Rob Edgar for their help putting the float together on parade day. We’d also like to extend a thank you to Sheila and Clee Crawford for the road-side balloon delivery. And last but not least, we’d like to give a big thank you to Dan and Tatsuma for helping pick out all of the blue-ribbon chipping potatoes for the judging contest! And of course, we’d like to thank the special guest candy-throwers – Emma and TJ Chavez, Hector and Jayden, Rich’s son Eduardo, Walker, Rory and Mari! 2010 Potato Festival Parade Update: We Were Robbed! 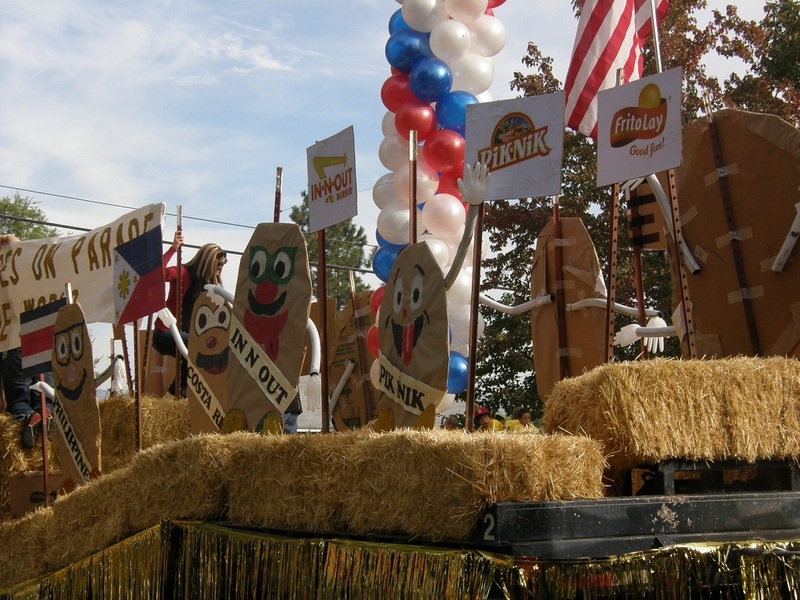 And Here's Our (Shoulda' Been) First Place Potato Festival Float! 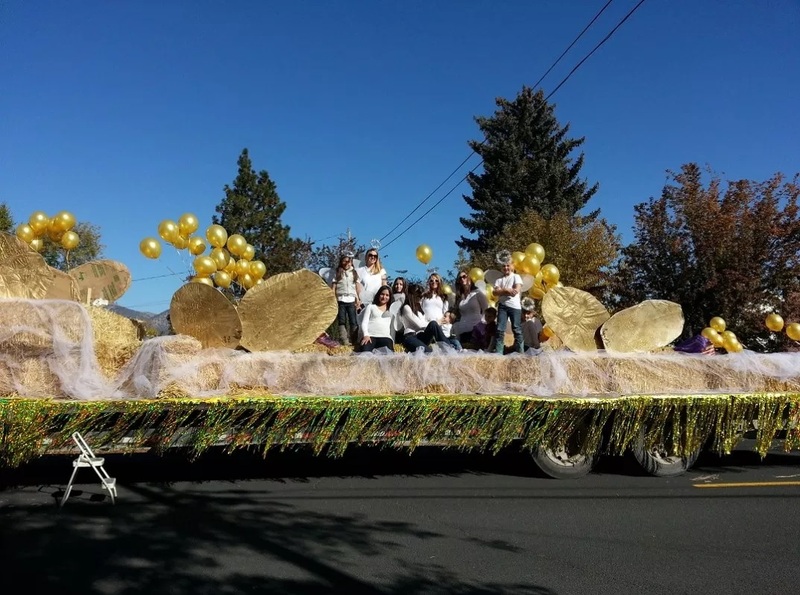 It’s been almost a month since that beautiful October day the 73rd Annual Klamath Basin Potato Festival parade was held, and amazingly we still have news about it! 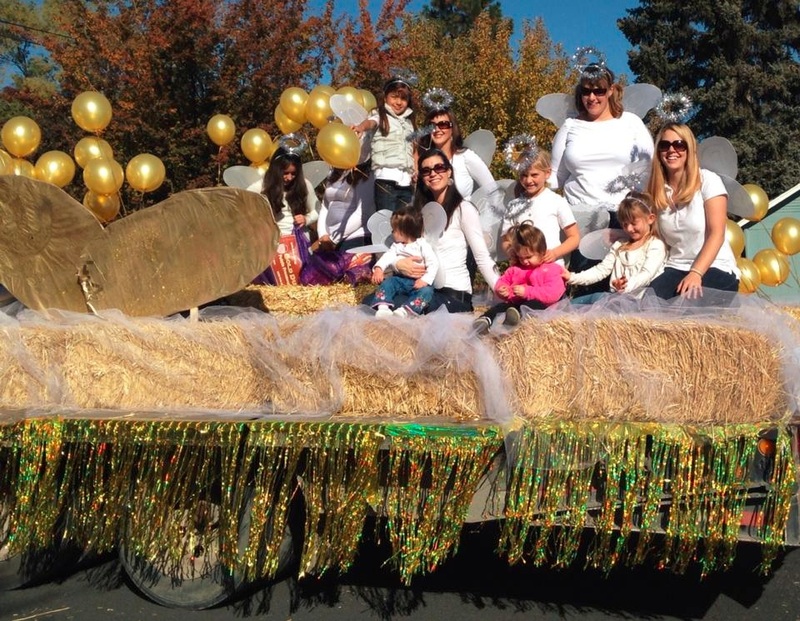 Last year, we took second place to the Merrill branch of Sterling Savings Bank float in the Commercial category of the parade. 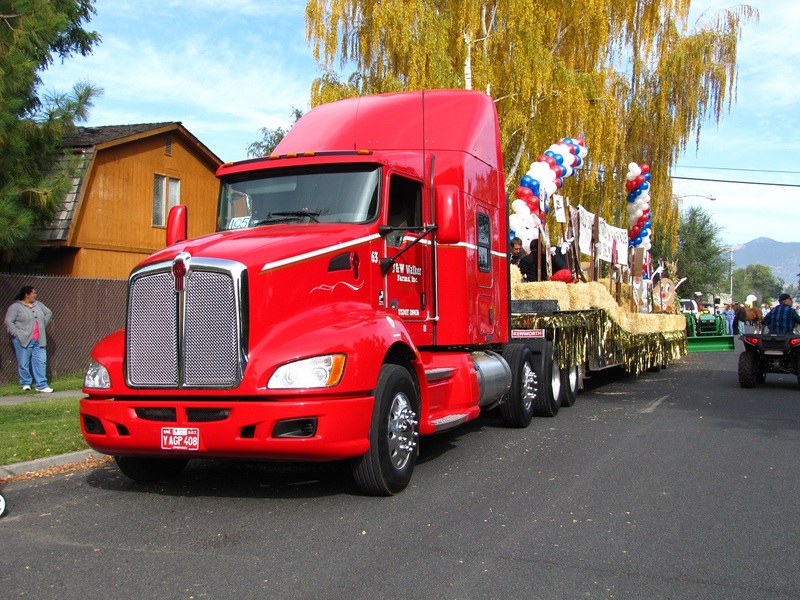 The theme was, as you recall, “This Spuds For You!” and with the help of a semi and trailer, Sterling Savings put together a pretty impressive (read large) float. Undaunted, the Gold Dust crew vowed to take first this year. 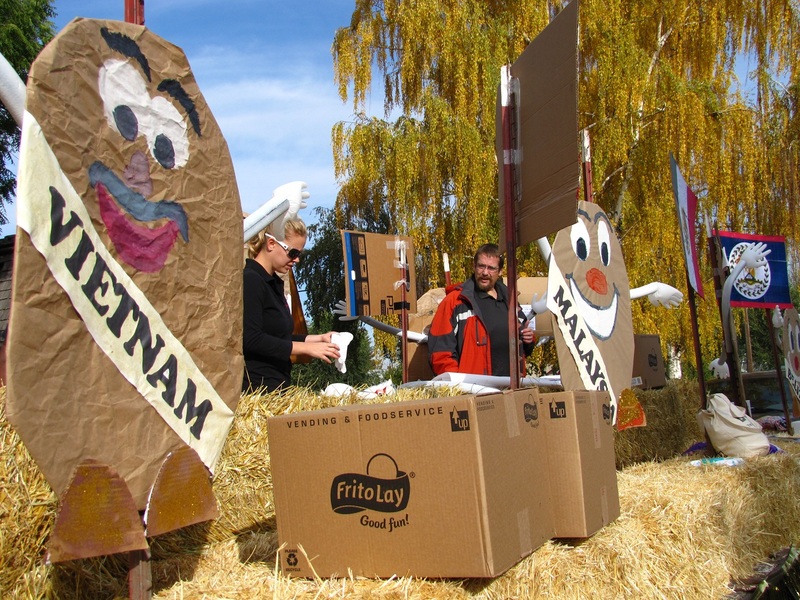 With the theme “Potatoes – Can You Dig It?”, we were sure cute kids, dogs and an awesome float depicting hard-working farmers (as well as handing out bags of Lays potato chips!) would seal first place honors for us. Unfortunately for us, the Merrill Lion’s Club awarded first place in the Commercial category to a bunch of hippies. 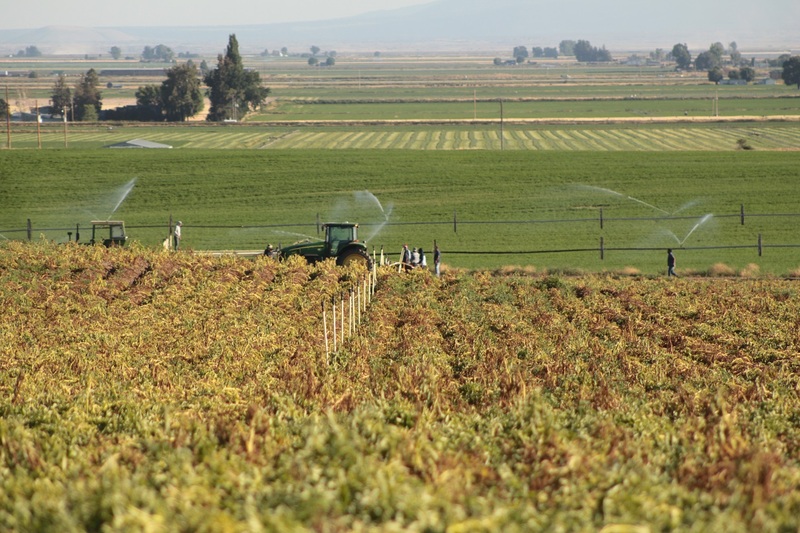 That’s right – not hard-working farmers but a bunch of hippies! We have to admit their twin towers of rainbow balloons and guest appearance by Austin Powers was pretty impressive, but c’mon! We had kids and dogs! Who doesn’t love children and puppies? Anyway, congratulations to the Sterling Bank team for putting together another fun float. And thank you to the Merrill Lions Club for all the hard work they put into to another excellent Spud Festival parade. We had a lot of fun this year and are looking forward to doing it again next year! And watch out Sterling – we just might win next year! If you weren’t able to make it the parade (shame on you! 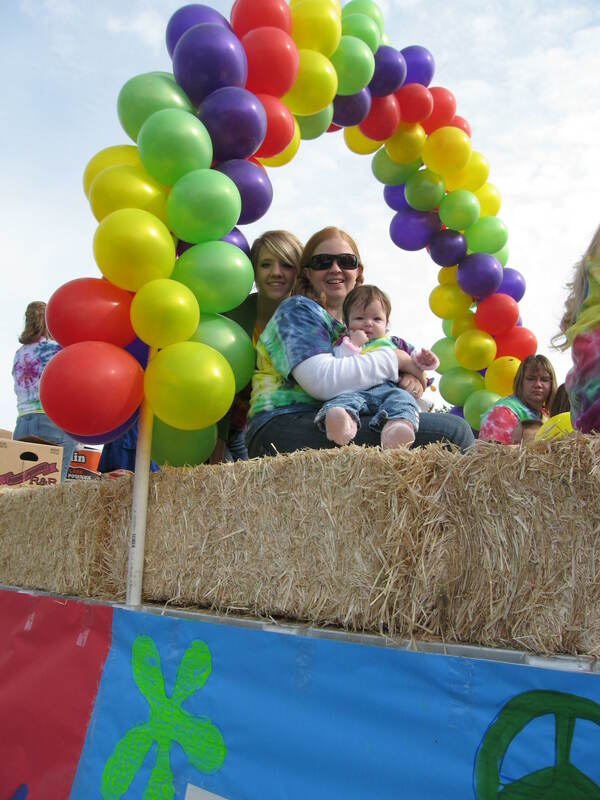 ), we have pictures of our awesome float as well as that other one. 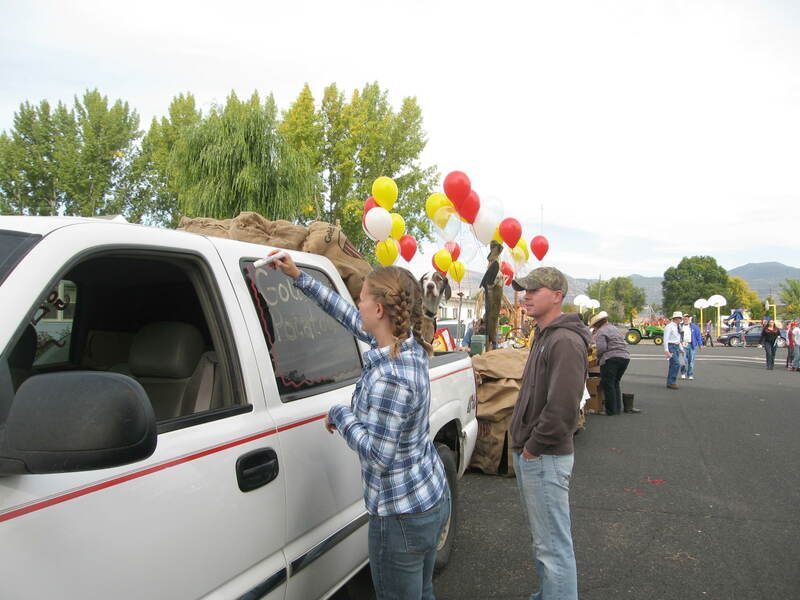 And we hope to see you along the streets in Merrill next year for the 74th Klamath Basin Potato Festival! Farmer Walker Is Ready To Roll! Myra Talked Nayeli Into Coming With Hector – Good Job, Myra! First Reason We Should Have Won – Cute Kids! See Nayeli, You’re Having Fun! Necia, Katie and the Gold Dust Dogs Looking Spuderific! 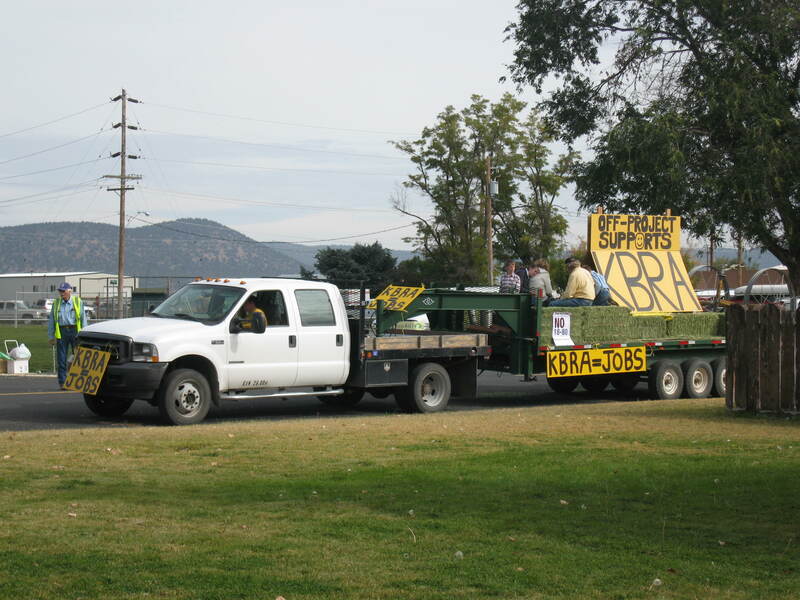 Hurray For Off-Project Support Of The KBRA! And Here’s Our (Shoulda’ Been) First Place Potato Festival Float! And Here’s The Hippies That Beat Us. We’ll Get You Next Year, Sterling Bank! 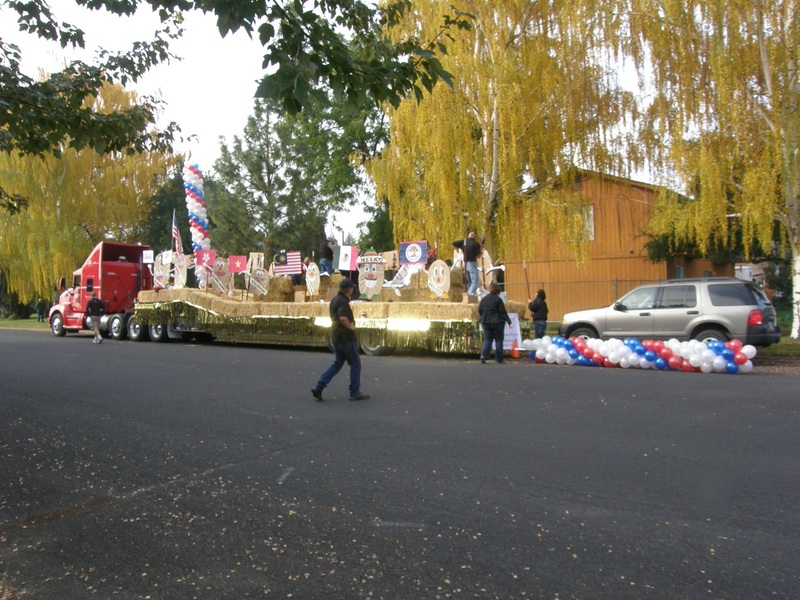 Before we go, we’d like to again thank the Merrill Lions Club for putting on the parade as well as the folks from our office who took time on their Saturday to decorate the float and participate in the parade. We really do appreciate it. 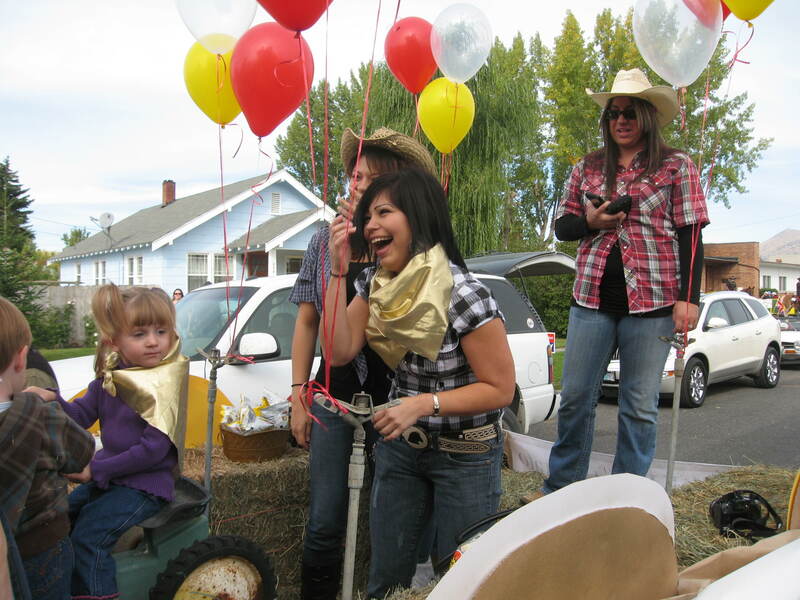 2010 Klamath Spud Festival Is Coming! It’s the middle of October. The cool, crisp nights are putting color in the trees around the Klamath Basin. If you look to the sky over the farmland around Klamath county, you can see pillars of dust in the sky indicating potato harvest is still underway for many area spud farmers. In the small town of Merrill, picnic tables are being set up while vendors stake out their spots. What do all of these signs point to? 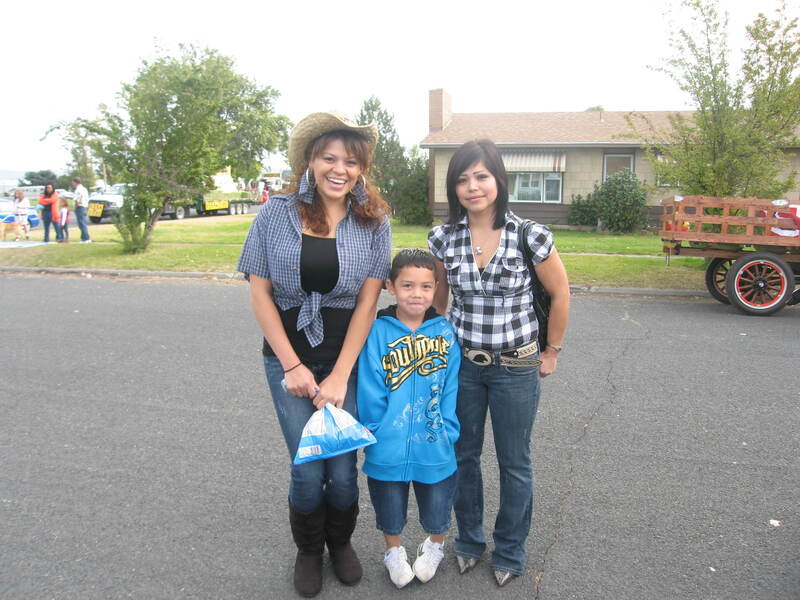 Klamath Spud Festival time! 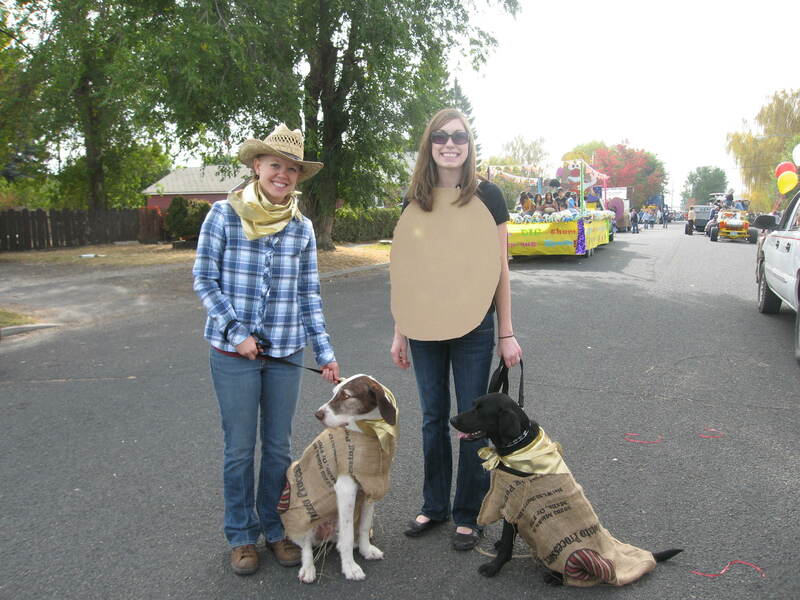 The Klamath Basin Potato Festival is here again. 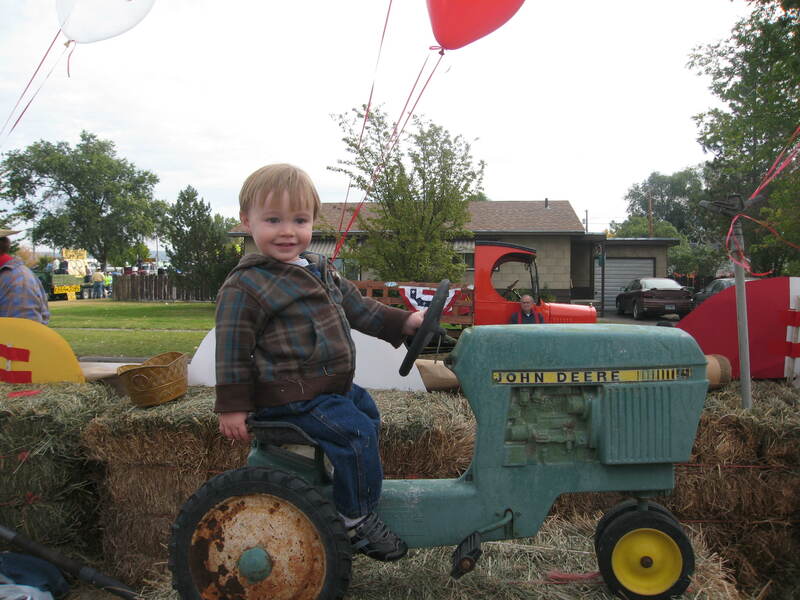 Between October 15th and 16th, folks come from all around to Merrill to take part in the festivities. Though the Spud Festival will take place over two days, the biggest day is Saturday, when at 11 o’clock in the morning the parade begins. 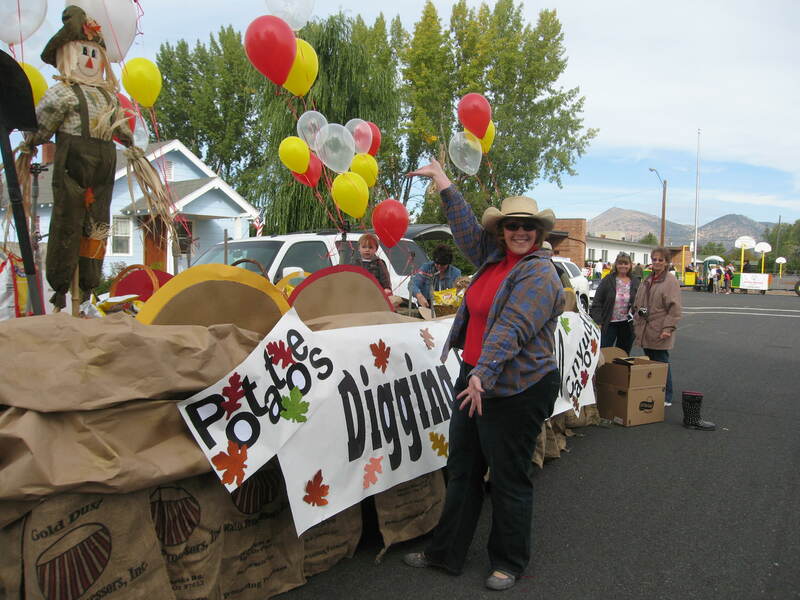 The theme for this year’s festival is “Potatoes – Can You Dig It?”, and we’re hoping our float is a big win with the judges and the crowd. Last year, the Gold Dust team received second place honors, but this year we’re hoping to take first! 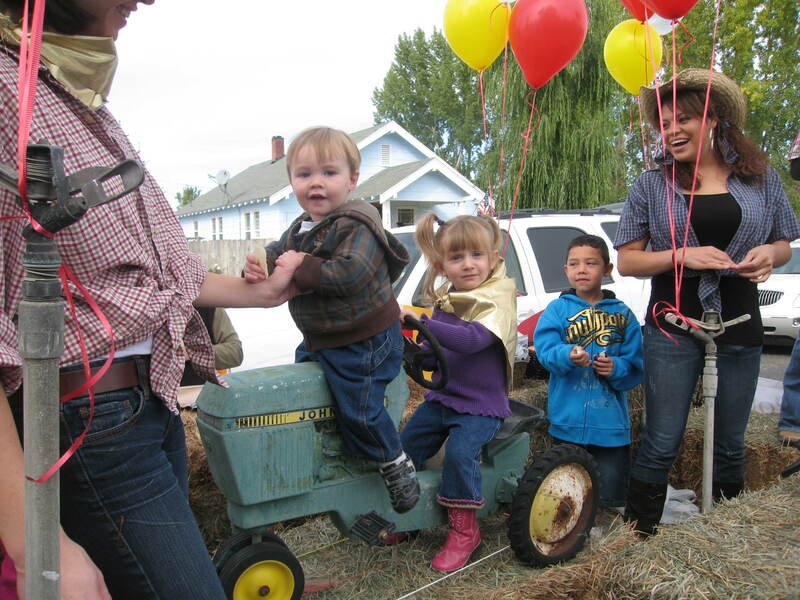 The Potato Festival is a really fun family event. With a free BBQ put on by the Merrill Lion’s Club, live music, lots of booths, exhibits about potatoes and Basin agriculture and Saturday football game, there’s something for everyone. 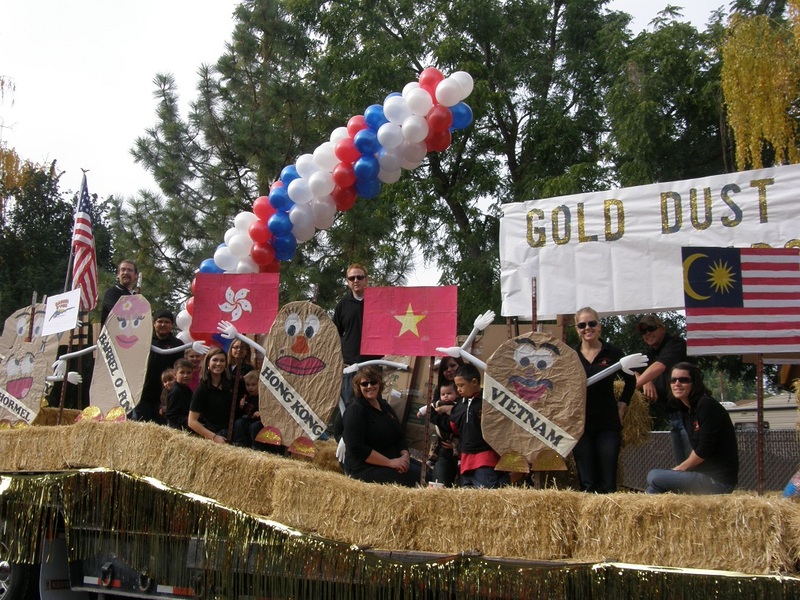 We hope to see you there – and be sure to cheer at the top of your lungs when you see the Gold Dust float go by! Gold Dust's latest bumper crop - Tater Tots! 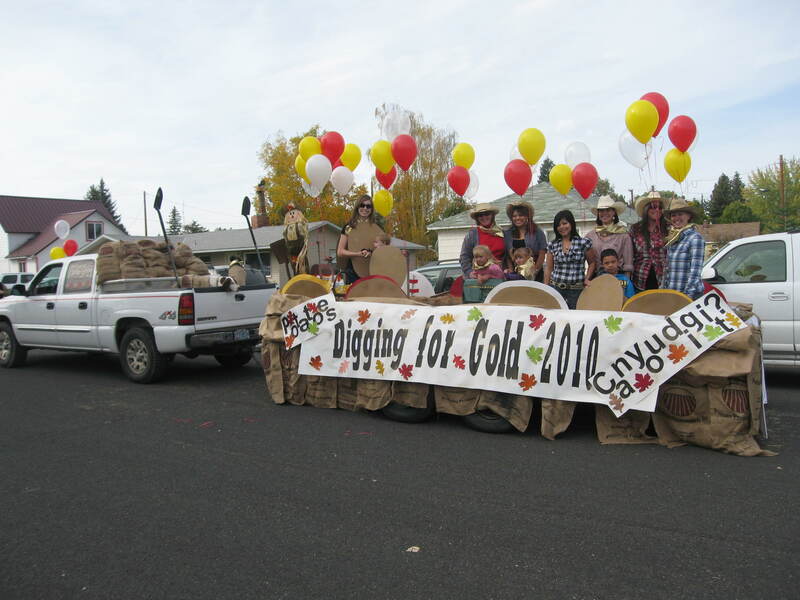 While we thought the Gold Dust Tater Tots should have taken first place in the 72nd Annual Klamath Basin Potato Festival parade (granted, we’re a bit biased! ), we are very proud to announce that our float took second place in the Commercial category. For that honor, the Merrill Lions Club gave us $20 in prize money for our efforts. Congratulations to the Tater Tots Crew! The float that took home first place in the Commercial category also won the big prize for best overall entry. A big congrats goes out to the Merrill branch of Sterling Savings Bank! 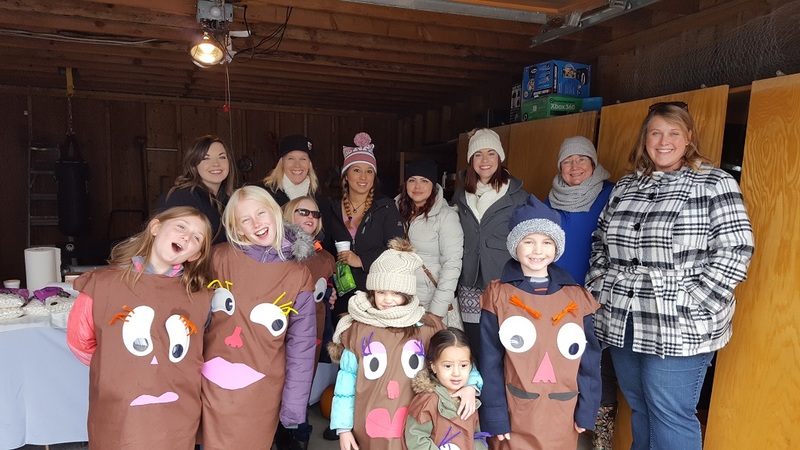 Sterling took the theme, “This Spud’s For You”, to heart and featured a lot of local kids in costumes ranging from a baked potato and tater tots to silverware and more. They did a great job and the prize was well awarded. We would like to take this opportunity to once again thank Tricia, Lexi, Jessica, Nayeli and Brita for their help putting the float together. We also owe a special thanks to Matt for his help getting the float on the road the day of the parade. And we have another extra special thanks to the Tater Tot kids – Rory, Walker, Emma, Lindsay, Ashlee and Mari! 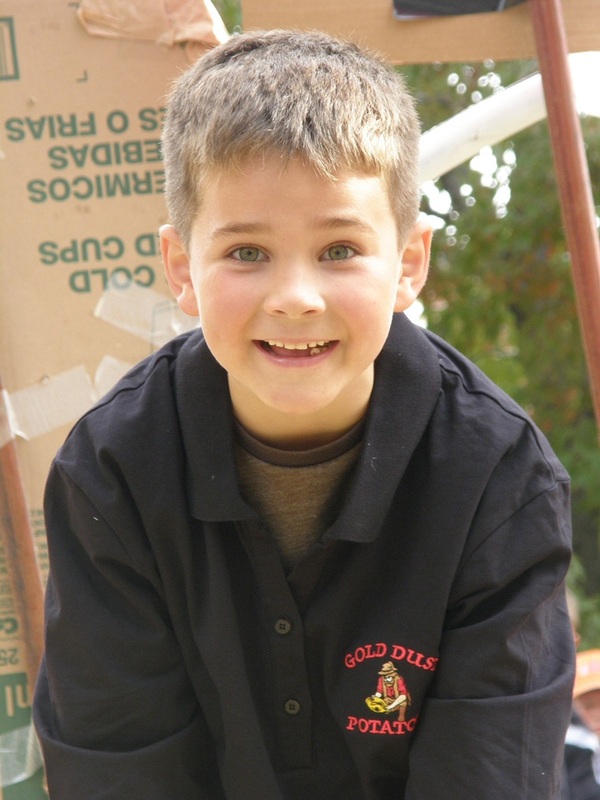 Without the help of Gold Dust’s employees and the presence of these kids, we wouldn’t have taken second place or had as much fun at the Spud Festival. Finally, we would also like to thank the Merrill Lions Club for awarding us second place. 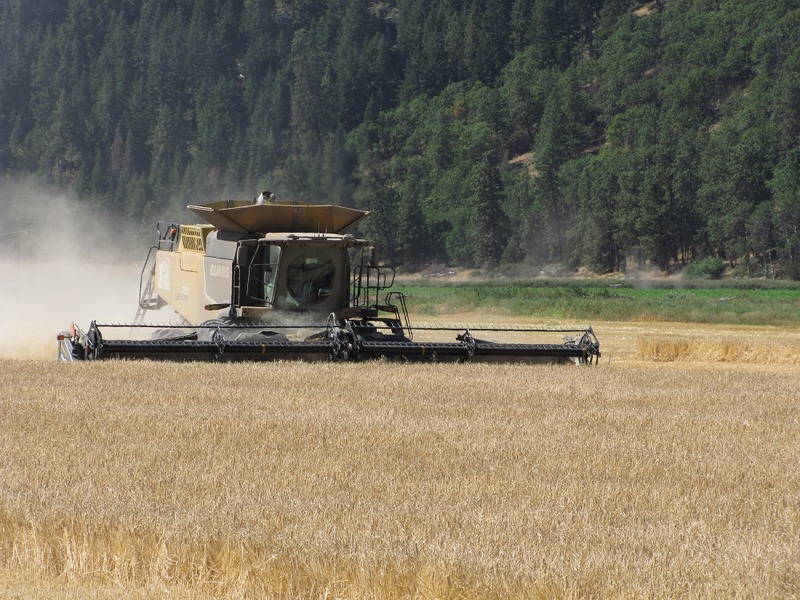 Gold Dust and Walker Bros. Farms look forward to doing it again next year! Last Saturday was a beautiful day for a parade. 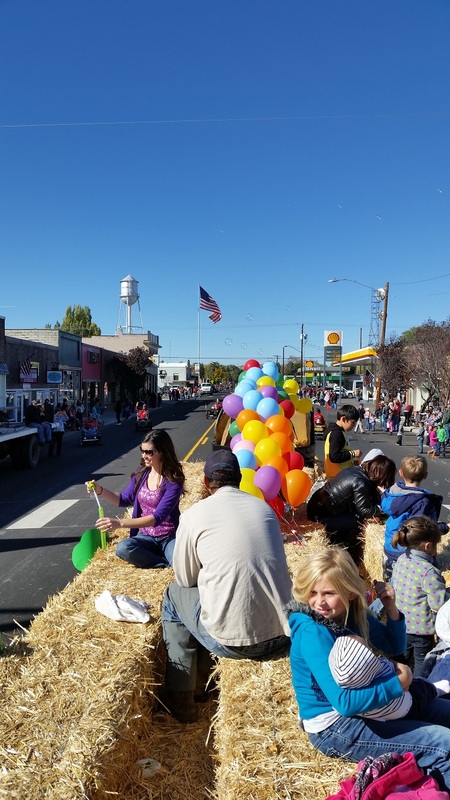 The crisp October morning provided plenty of sunshine and kept the threat of clouds at bay while folks made their way to Merrill for the 72nd Annual Klamath Basin Potato Festival (also known as the Spud Festival). 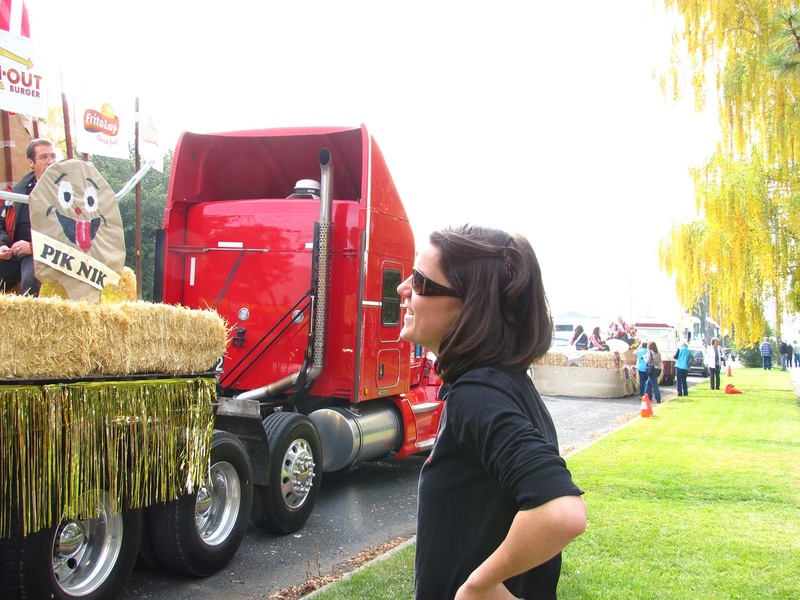 And it was at the Spud Festival parade that Gold Dust and Walker Bros. Farms released their latest product – Tater Tots! As with chipping potatoes, Gold Dust’s Tater Tots take a lot of time and care to raise, plus plenty of love. 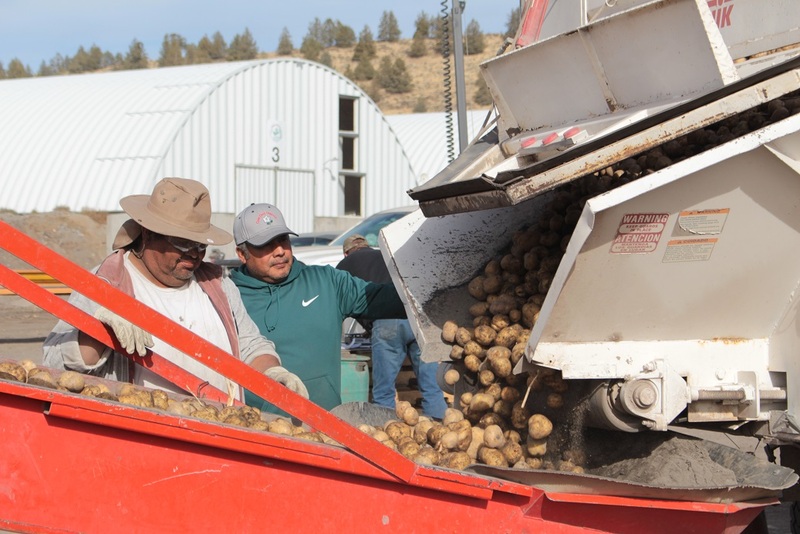 We’re sure this bumper crop will ensure not only the future of potato farming in the Klamath Basin, but for Gold Dust and Walker Brothers Farms as well. The float was put together by the talented crew of Tricia Hill, Jessica Christensen, Lexi Crawford, Nayeli Pena and Brita Binderup. Gold Dust would like to thank these ladies for not only putting in extra time after the work day was over to build the float, but also for taking time out of their Saturday to ride on it and make sure the Tater Tots stayed on board! Judging from the people lining the streets for the parade and filling the exhibition hall, it looks like this year’s Potato Festival was a success. 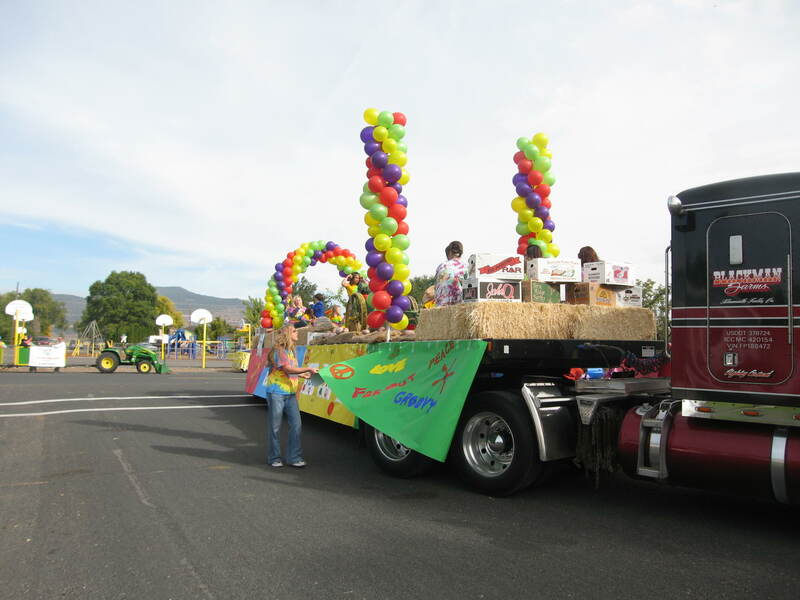 There were lots of fun floats that played with the theme “This Spud’s For You!” with local businesses, schools and other organizations showing up to enjoy the sunny morning and show their support. 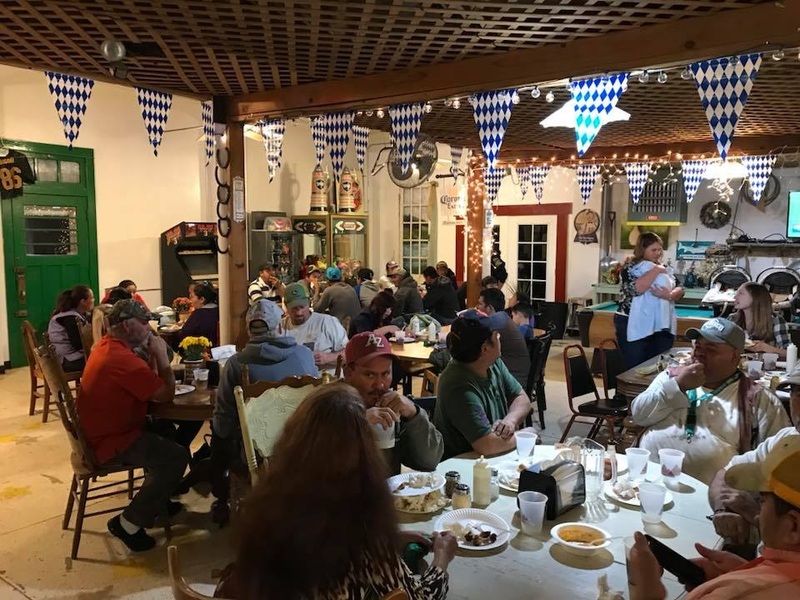 Farmers, workers and folks from inside and outside of the farming community enjoyed free baked potatoes and BBQ for lunch as well as a fun-run, horseshoe tournament and live music from the Old Time Fiddlers and other local bands. 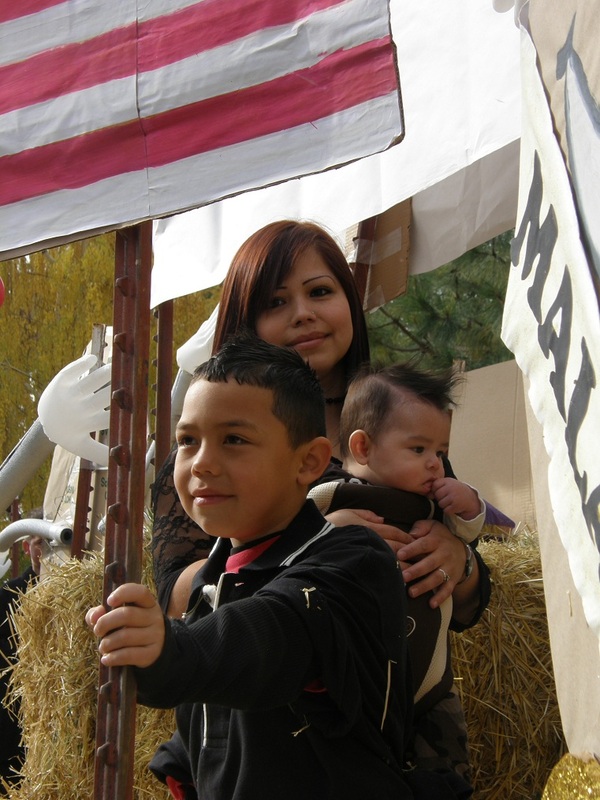 We hope you’ll join us next year for the 73rd Annual Klamath Basin Potato Festival. 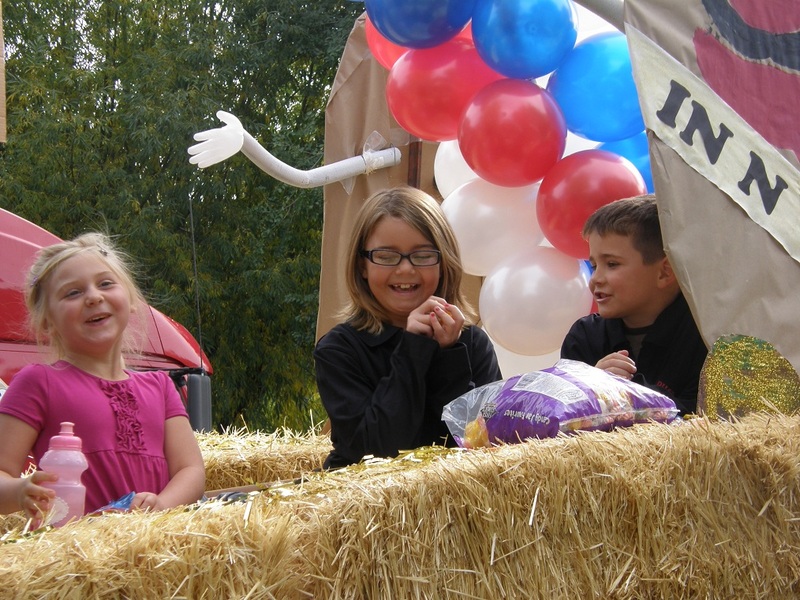 Until next year, we hope you’ll enjoy a few pictures of our float and the Tater Tots! Gold Dust’s latest bumper crop – Tater Tots!